Does triathlon numb your emotional responses to life? I have a theory (and so does my hubby) that most endurance athletes are running away from something… when you’re not zoning out during training to endure the pain, you’re too tired to even think about anything else. It’s almost like training can numb those emotional nerve endings. That’s why I love to be involved with film. It makes me feel again. After spending 30 hours a week trying not to feel it takes some practice to bounce between the 2 careers! Now crying on the trainer while watching a good movie…THAT takes practice! This weekend was the last race of the season. Its the San Diego cross country champs and it’s a b**ch of a course! Not to mention there’s dogs and people running all over the trails so to tell them to get out of the way when you’re breathing out your arse ain’t too much fun! 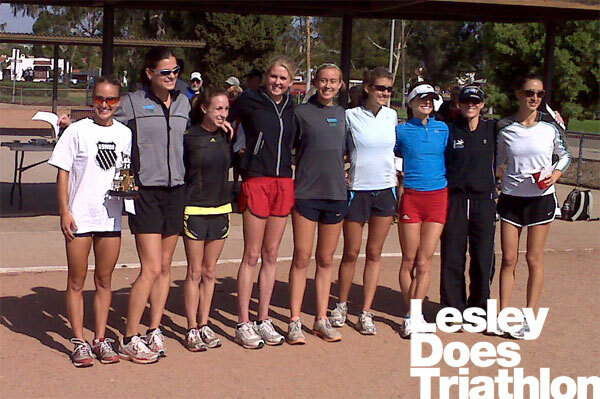 However, the San Diego runners are a cool bunch and they like to treat me like a celebrity for a day! This is my writing-producing partner (Ian Stokell) and I on our morning ride to the Hollywood sign in order to brainstorm about our next script! U can see the sign in the distance – just!